The site of the 50-acre (20.3ha) Roman legionary fortress of Isca was the permanent base of the Second Augustan Legion from about A.D. 75. Today, impressive remains of the fortress baths, barracks, amphitheatre and fortress wall can be seen. 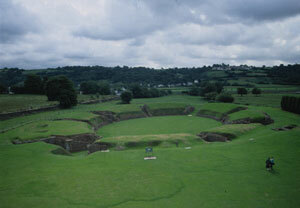 The amphitheatre (shown here) was probably used for basic military training as well as gladiatorial combat and other fierce blood sports so common to Imperial Rome.